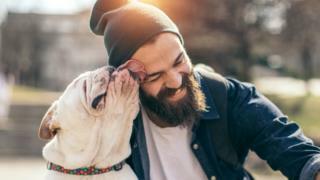 Researchers from the Hirslanden Clinic in Switzerland took swabs from the facial fuzz of 18 men and the necks of 30 dogs, across a range of breeds - that's the dogs, not the men, by the way - and compared the results between the two. "The researchers found a significantly higher bacterial load in specimens taken from the men's beards compared with the dogs' fur." After all that, maybe it's time to tell your dad to have a shave! Dogs are cleaner than beards! Even though both have a nice shower every day, a beard is still dirtier! Cool and very long name! You have got to admit - dogs aren't that dirty, compared to beards!